Join the discussion on our forums! 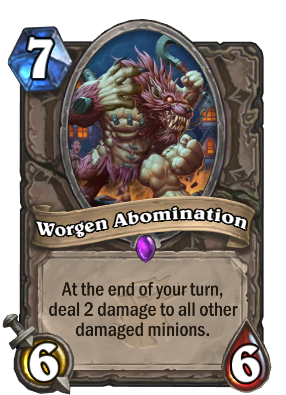 Come discuss Worgen Abomination over in our dedicated Worgen Abomination discussion topic. At the end of your turn, deal 2 damage to all other damaged minions. Does anyone want to play dead!? Control Warrior has used Baron Geddon in the past. They might find a home for this. U can manipulate his effect to not hurt what you dont want to. Awesome card. Worth playing in most decks. Do you like to play with fire? Burn. Good inclusion for AOE Warrior decks but the cost is too high to be comboed into comfortably. It might be playayble but let's just forget about effect and look for that art. That is one sick combo. this isn't really a bad card it's a beefy version of baron with 1 less attack and 1 more HP, it kinda punishes trading because those minions will take an extra 2 - 4 damage damage, this works very well in warrior with bloodrazor since warrior seems to lack large AoE's in the later turns especially with sleep with the fishes rotating out, but this also works with sleep with the fishes. there could be a world where this works with that.. really bad Tower legendary being able to damage it using this card without having to run to many WW effects. yeah... just seems like an alright card nothing to OP not weak either it's just average but we all know average cards don't always see much play so it might not unless there is a deck that can make use of this? but more of a very solid arena card. Probably best in Control Warrior and Rush Hunter (if that becomes a thing). May see play in other control decks that run Wild Pyromancer but it's a bit too expensive for most decks. It's very intriguing but we don't see Baron Geddon played a lot and it's fairly similar. It's definitely a very good card, but whether or not that translates to very good decks is another question entirely. It'll surely be a good selection in arena. Well you can have 2 of this in the deck unlike Baron Geddon, also has a bit more control and doesn't hurt your face. Also has an interesting synergy with what warrior often wants to do. WHAT IS THIS ABOMINATION?! Oh, it's just a Worgen Abomination. This card is easily comparable to Baron Geddon in terms of mana, roughly stats, and roughly ability withBaron Geddonhaving more attack over health and having his effect deal to everything else. This card is able to survive a bit more easily and has an effect that is more restricted. Seeing as how the only two classes that I remember running Baron Geddon are warrior and mage (I think big druid also ran it, but not really sure), with mage only running it as he's an elemental. This leaves warrior being the only one who has ran Baron Geddon in the past, but in any recent control lists this hasn't been the case. This card is just too pricy to see play in my opinion being too clunky for a commonplace removal. Seeing how Sleep with the Fishes not only deals an extra damage but also costs 5 less mana at the cost of a 6/6 body, this card just feels even worse. If the card's mana and stats were all 1 less, I feel like this card could see some play, but with this mana cost and stats, I don't feel like it will see play. Sleep with the Fishes rotates to wild though. So even though it is worse you might still run it in standard. This will either be lame and a joke or someone will find a really annoying meta deck to throw this in and we'll all hate it. There is no middle ground here.